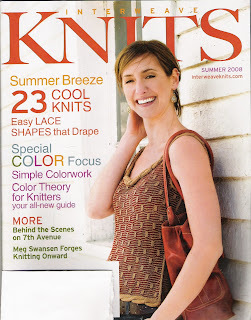 I feel a little guilty for what I am about to do: trash talk Interweave Knits again. I can't help it. I'm critical and judgemental. I never intended to turn this blog into a rant, but when I see wrongness, I just have to point it out. Mind you, no evil enjoyment intended. Or perhaps this model is graduating from clown college. 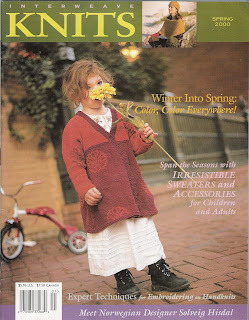 Some of the designs in this issue rival those of Knitters for cluelessness. They are LOUD, although I will say the IK designs tend to have better shapes. Now that I've got that off my chest, I will say that I really like some of the designs from this issue, mainly the cover piece, the lace hoodie, and the plaid halter. The lace designs are nice in general. But this post isn't about the good. Not my favorite design from the book, but , you have to agree, much saner than the IK one. I have to ask - What is Eunny thinking? She must be thinking of differentiating herself from her predecessors, making her mark, changing the style of IK. This is clear when you compare covers over the years. Today's IK? Trying to be slick. 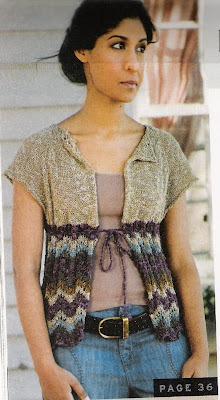 And why did they inconveniently separate the garment photos from the pattern instructions? Is it more slick that way? And I miss the model who looks a little like a beautiful camel. You know who I mean. OK. I'm done ranting. I agree. The summer IK was very disappointing. 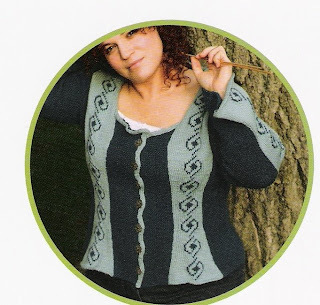 One of things I like to do with patterns from sources like Interweave Knits is to see how many people on Ravelry have selected them as current or future projects. 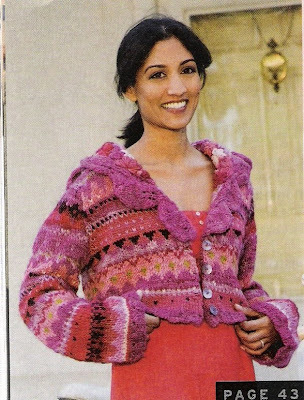 For instance, that jacket on page 43, which I also find excessively colorful, is on the needles of three knitters already. Clearly they disagree with us. On the other hand, not one person has selected the geometric number on page 35. Must be interesting for the publishers to get such fast feedback on the popularity of their designs. I was disappointed too. That bright pink number is stunningly ill-fitting on top of everything else. 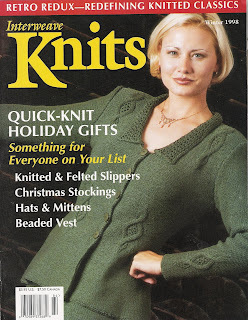 My pet peeves, not only but especially with IK, are garments that just don't lend themselves to handknit fabric, like peasant blouses -- items that work so much better in woven fabrics. Sure they are innovative but I don't think they work all that well or that many body shapes are flattered by them.